This is an unpublished draft. Please publish before sharing publicly. Emily Davison, the suffragette who was to die in 1913 after throwing herself in front of the King's horse at the Epsom derby, is famously said to have secreted herself in the House of Commons at the time of the 1911 Census in order to have herself enumerated within Westminster. We have uncovered the actual historical documents that prove this is the case and will perhaps throw some more light on this key moment in parliamentary history. The event is considered to be such a landmark event in British politics that a plaque was secretly installed in Parliament in honour of her rebellious act by Tony Benn, with the aid of Helena Kennedy QC and Labour MP Jeremy Corbyn. We had already found Emily Davison on the census listed at her boarding house, but had wanted for some time to discover how much truth there was in the parliament story. Thinking laterally, we realised that there was a possibility that she had been incorrectly recorded, and decided to try searching for her ticking the "variants" box on the 1911 Census search. This search not only looks at exact names searched for, but also looks for common variants of names. 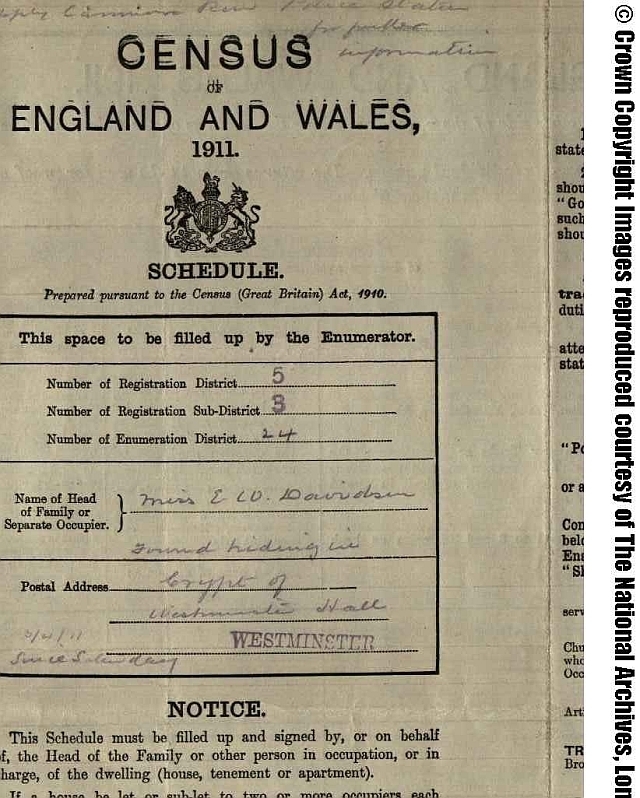 We had already found Emily Davison on the census listed at her boarding house, but had wanted for some time to discover how much truth there was in the parliament story. 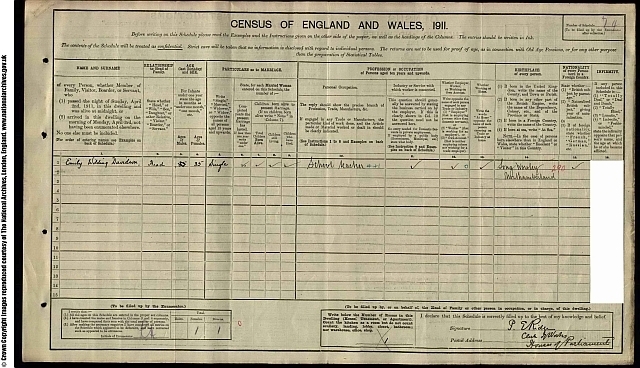 Sure enough, when we repeated the search with the surname variants search on and allowing a few more years flexibility than her actual age at the time of the census, she immediately appeared listed as Emily Wilding Davidson (note the extra D in her surname). Most astonishingly, her address was listed on the census transcript as "Found Hiding in Crypt of Westminster Hall Westminster". Intrigued, we decided to look at the original documents. First of all, we looked at the RG14 Household page - this has been signed by the Clerk of Works at the House of Commons, a Mr Percy Ridge (for a bit of fun, you can also find him in the 1911 census, living in South London). 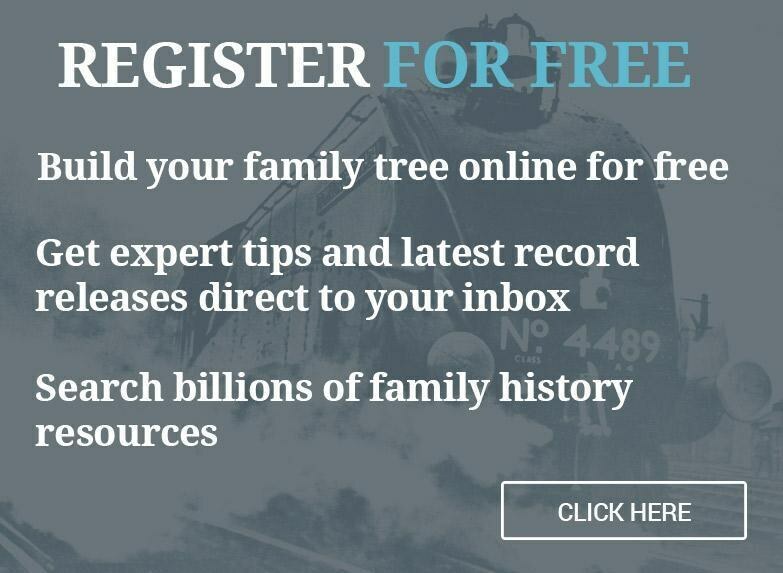 Click here to view the full size image. We can see that Ridge's handwriting only records Emily's name (spelt wrongly), age (3 or 4 years off her actual age) and marital status. 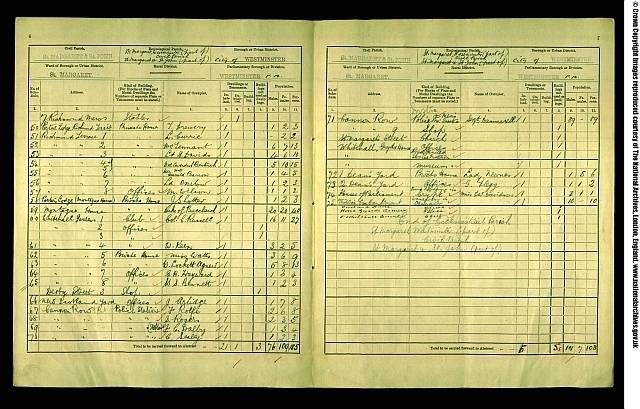 Somebody else (likely to be the enumerator – the handwriting looks very similar) has filled in her occupation and place of birth. It is notable that both of these bits of information are wrong too – Davison had given up full-time teaching in 1909 to concentrate on her work for the Women's Social and Political Union and her birth was registered in Greenwich, not Northumberland (Davison's mother, however, had been born in Morpeth, Northumberland). So now on to the back of the household form, to see where this extraordinary address from the transcription had come from. Sure enough, Ridge has put her address as “found hiding in the crypt of Westminster Hall since Saturday" There's also a note at the top which says “apply Common Row police station for more information". So finally, a quick look at the Enumerator's Summary to see whether she succeeded in her aim of being enumerated at Westminster. Sure enough, she has been enumerated as the sole occupant of the Crypt in the "Houses of Parliament". 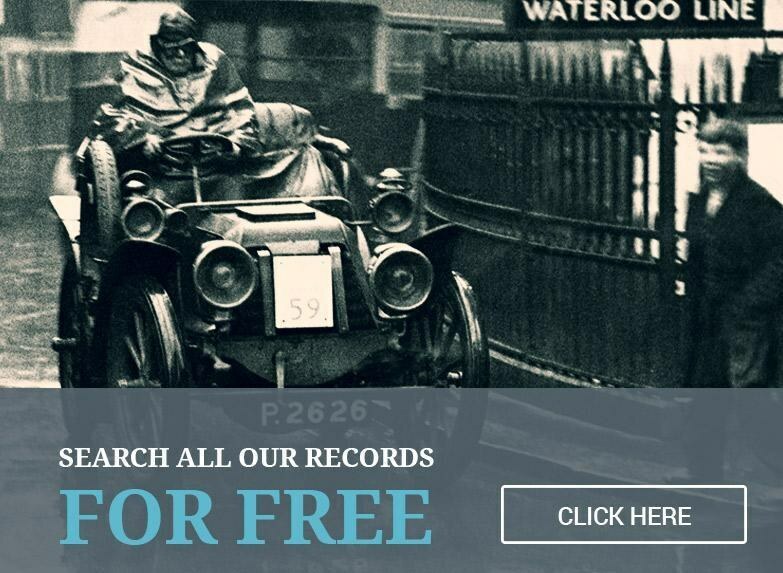 Use the "variants" search on Findmypast - it really is a powerful piece of technology! Emily Davison, we salute you, and are proud and humbled to have found the documents that record your astonishing census night 99 years later. If any of our readers can shed any further light on this astonishing find, we'd be delighted for you to add notes and observations in the comments below.